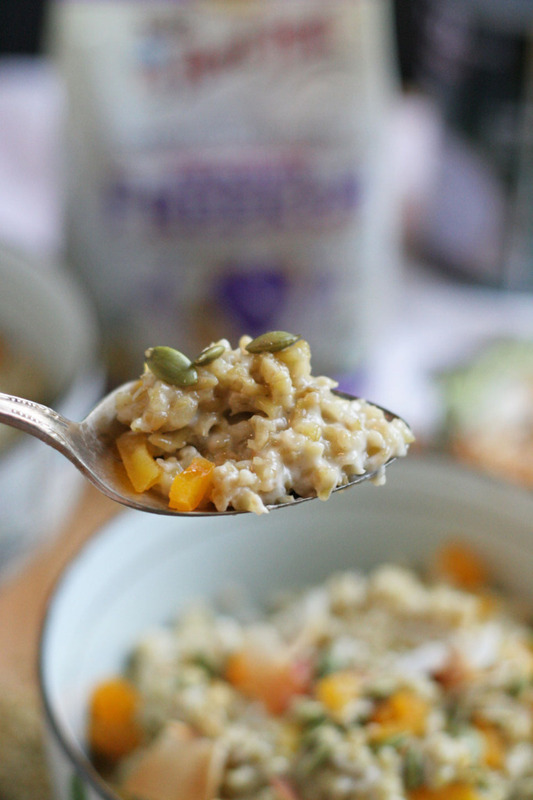 Freekeh Breakfast Bowl and Bobs Red Mill Giveaway! Disclosure: This is a compensated post in collaboration with Bob’s Red Mill. As usual all opinions are my own. Thank you Bob’s Red Mill for making NJB awesomeness possible. By the way, I am elated to be working with Bob’s Red Mill as a recipe developing food blogger. I have been using Bob’s Red Mill products for decades. I love the company, and what they stand for and what they do. It is a treat to live here in Portland and have to opportunities that I have had to tour the Mill, bloggers style, and meet Bob. He is genuinely an incredible person with the utmost awesome intentions as a business man. I am super grateful! Let’s just get it out there, start with serious honesty… I am in love obsessed with Bob’s Red Mill Organic Cracked Freekeh. It is slightly chewy, nutty, versatile, highly nutritious, and filling. Ok, now that we have that cleared up I can talk about using it lately. Another honest alert, Brian does not love all whole grains like I do. I could eat brown rice, freekeh, and any grain all day every day, the nuttier the better. He is a bit reserved. He likes quinoa, brown rice hidden with goat cheese and sausage, and white jasmine rice is his favorite. But I have to forget that, and continue to cook my glorious whole grains, including Freekeh. His verdict, he likes it, and I am relieved. You can eat it cold, or hot. Add it to salads, as a simple side dish, or add greens to it for a warm side dish. 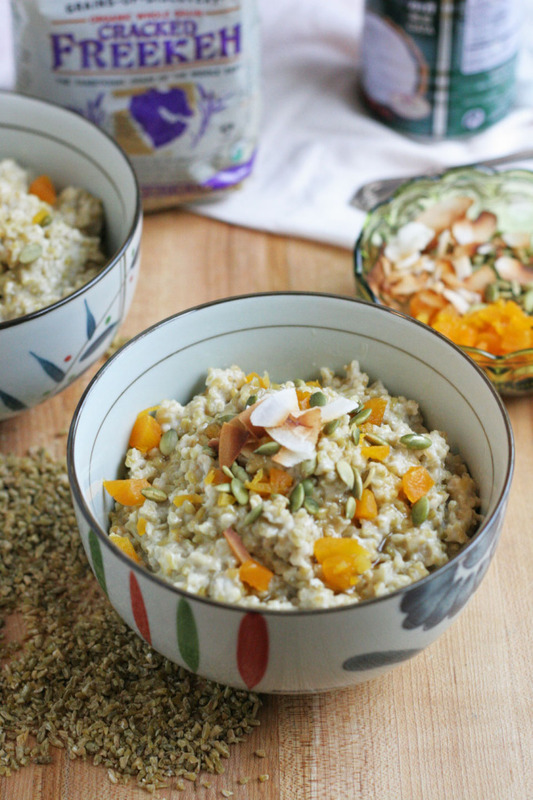 My new favorite breakfast is this freekeh breakfast bowl with coconut milk. I love coconut milk, not coconut water. Although you can use milk, or water, the coconut milk is creamy, and gives the freekeh a luscious texture that is super good for breakfast. So good. And then adding fruit, seeds, nuts, and dried fruit for texture makes for a filling, and healthy breakfast. The giveaway is closed and a winner was chosen. Thank you so much for entering and for your support! I am happy to bring you more awesomeness! 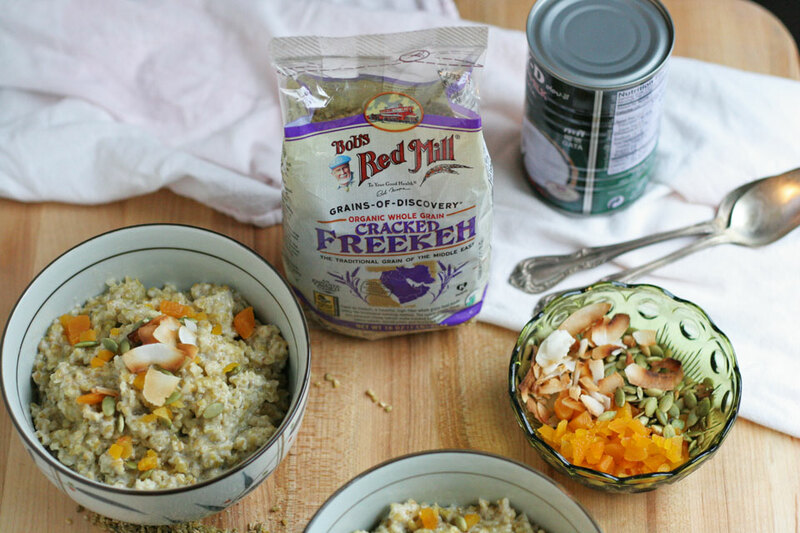 Bob’s Red Mill and I are giving you a chance to make this Freekeh at home with a generous giveaway yay!!!! The winner will be chosen on Tuesday November 6th at 12am PST. The winner will be emailed and a response is needed within 48 hours, or another winner will be chosen. Thank you. follow rafflecopter promps and thank you for entering! I shared this recipe on ABC’S KATU AM Northwest Portland, here is the segment! 1. In a medium sauce pot, add freekeh, milk, honey, cinnamon, and salt. Cover, and cook over medium heat for 30-35 minutes. Remove from heat. 2. Serve in individual bowls. Top with chopped pears, pumpkin seeds, dried apricots, and toasted coconut flakes. Store leftovers in an airtight container for up to 5 days. Reheat in microwave, and top with your favorite toppings and have a nutritious easy breakfast on the go! I haven’t ever tried freekeh—I looked for it once after seeing it used in a recipe in a magazine, but I couldn’t find it. I’d love to, though, so I guess I’ll just get some from Bob’s! Oh man, it is a bit tough to find. But Bob’s online, or try a bulk section of Whole Foods, natural foods store, Mediterranean grocery, or Middle Eastern grocery. Hope you find it! I haven’t tried Freekah before, but it sounds really great! It’s so good, I hope you try it! I have never tried Freekeh but you make it look so good! Thank you, Carolyn. I am a new lover of it, I eat it all of the time now! This is my kind of breakfast! So hearty and delicious! Thank you, Lori. It is so hearty, perfect before or after a good hike or workout! I’ve never tried Freekeh before though I love Bob’s Red Mill Products. We use them often, especially the gluten free products as they are one of the few that sell GF around my area. Wow, that’s crazy they are the only ones. But such a great thing, because they are so awesome! I have a bag and this looks like a good recipe to try. I have not tried this, in fact, I had not even heard of it before your post! It sounds wonderful, and I look forward to trying it! I hope you like it, thank you! No I have never tried it. I have not tried Freekeh before but I would love to try it in some new recipes. It’s so easy to use, and I just love it. I love Bob’s Red Mill too! This looks wonderful. I haven’t tried Freekeh yet. I hope you do soon! It is so good. Yes, I have tried it once and I liked it a lot. Cool! Glad to know you like it, it is so good. I have not tried Freekeh. I have never had freekeh before. These bowls would be perfect warm on a cold day! Thank you, Erin! I hope you try it soon. I love all of the yummy toppings on this!!! So jealous you live so close to BRM! Thank you, Liz! I am so spoiled that way :). YUM, I would love this for breakfast this weekend! Can’t wait to try your recipe! I’ve never eaten freekeh before but I would love to try it! The flavors and textures in that dish look divine!! Thank you, Lynn. I fell in love with Freekeh, it’s my grain love. I’ve never heard of freekeh but now I want to try it bad!! Looks good! Thank you, Dorothy! You totally should try it, and I hope you like it. I haven’t, but I just bought a little bit last week to try. I’m researching recipes right now– but this looks like a great place to start! OOOOH cool! I hope you like it. I’m looking forward to trying freekah! Freekeh is a favorite around here! I love that you made it into breakfast – how fun! That is awesome! I love it with the coconut milk for breakfast. And hearty green with dinner. I’ve never tried freekeh … looks so good, Fabiola! Thank you, Cheri! Me too! I relate to your Brian, I haven’t tried it. 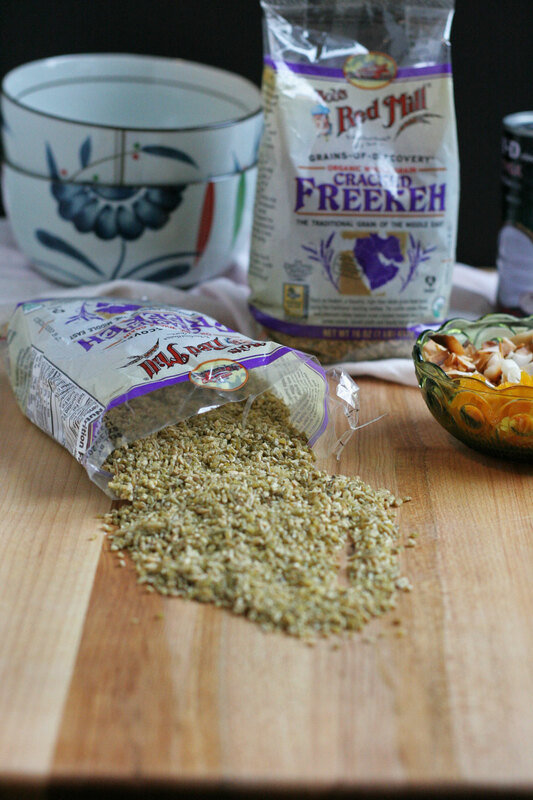 Never tried freekeh before, but it looks tasty in your recipe!